Add bookmarks to your document so you can easily recall special locations, or later insert cross-references. 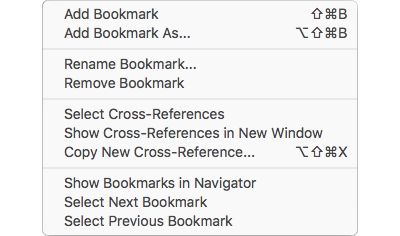 Bookmarks can be explicitly named by you, or automatically named based on the text to which the bookmarks are applied. Browse all bookmarks in your document using our navigator sidebar and quickly jump to the corresponding text. Bookmarks can be sorted alphabetically by name, or logically by their content location. Insert cross-references to bookmarks or other targeted content, automatically updating to show the target's current marked text, page number, line number, etc. 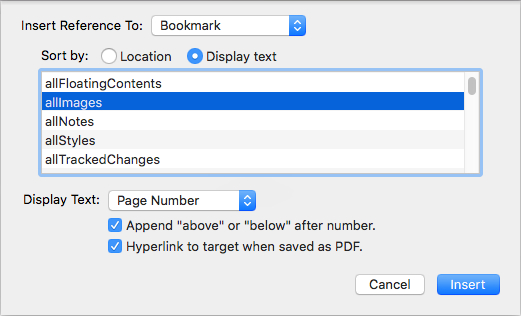 Cross-references export as clickable links when saving a PDF. or open a find results list showing them exactly. Usually when you insert a new cross-reference you need to find and choose the target in a cross-reference creation dialog. But sometimes it's much easier to go the other way around, starting by selecting the target in your existing document. Now you can with our new Copy New Cross-Reference command. Just select the target bookmark in your document and use the command Copy New Cross-Reference. That places a new cross-reference on the clipboard so you can paste it wherever you like. Simple. 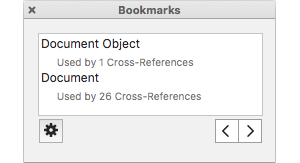 Read more in our user guide's help topic about Bookmarks and Cross-References.